Especially when creating a Process Plan, it can become necessary to inspect intermediate results (such as PDF files in their state in the middle of a Process Plan's processing steps and preferably some details about each step in the form of a log file or similar). This can help to understand and to optimize the configuration of the steps in a Process Plan and their inner workings as a whole. Note: This logging feature is not only available for Process Plans, but also for Profiles, Checks, and Fixups. 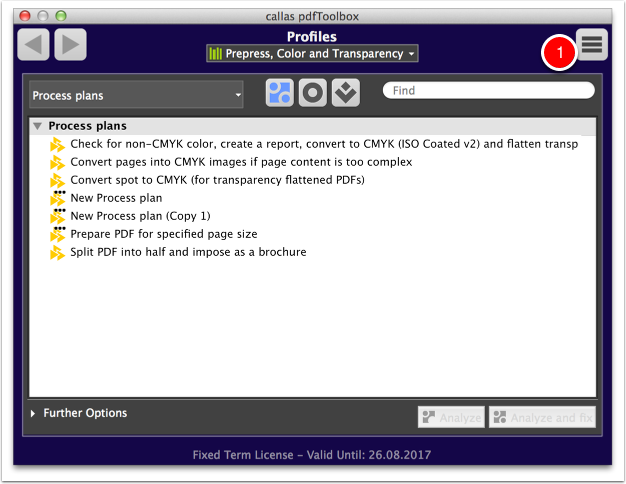 To activate logging, just click within one of the three sections of the Profile window on the flyout menu button in the upper right corner (1). 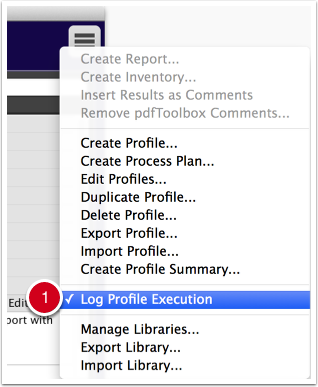 Select the entry "Log Profile Execution" (1). This option activates the logging of the execution of any Process Plans, Profiles, Checks and Fixups. 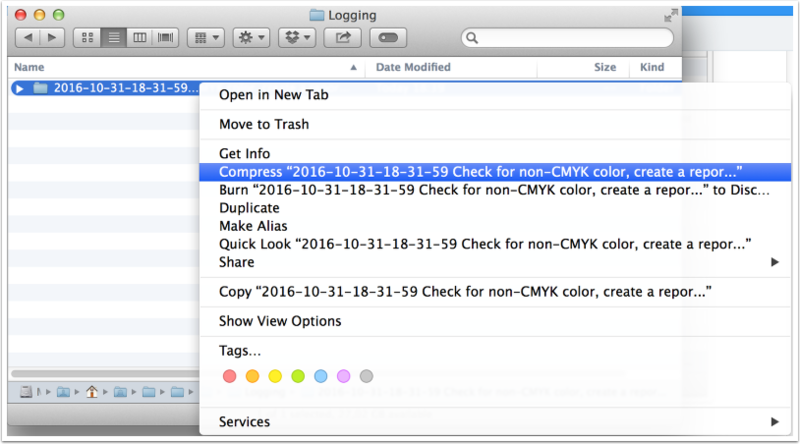 A check mark ("✓") in front of the menu item indicates that logging is active. In order to deactivate logging, simply execute the menu item again (1). The check mark ("✓") will then disappear from the menu item (2). Execute a Process Plan (or a Profile, Check, or Fixup). 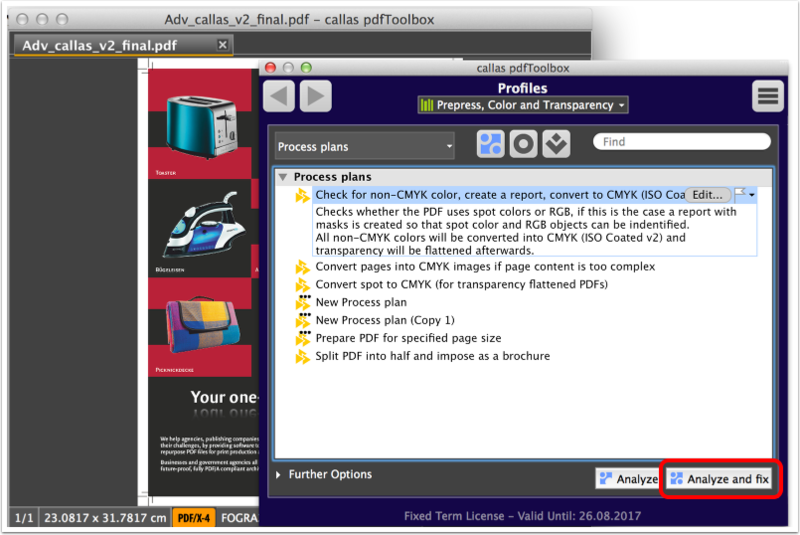 After processing the PDF, a window will open in Finder (on Mac OS X) or in the Explorer (on Windows), revealing a folder (having a time stamp at the start of its name) with all the logging data and associated files inside it. 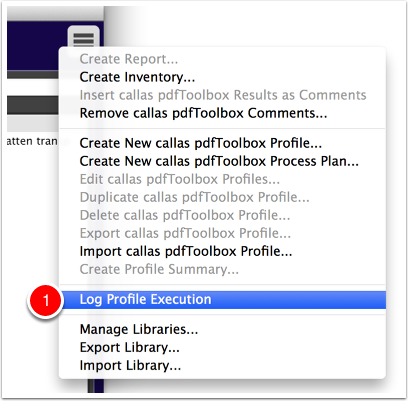 logging information in a file named "process.log"
When requesting support from the callas support team, you might get asked to send the complete logging package. Windows: "Send to..." - "ZIP compressed folder"